In an unmarked site on the edges of an Oregon community of berry farmers, Bob Harriman puts one foot on the world's most controversial grass. It's a blanket of brilliant green - as thin as a piece of paper and as uniform as cellophane. If it sounds unnatural, that's because it is. Scotts keeps the test site incognito because environmentalists are trying to ban the bioengineered grass - and radical groups have gone so far as to sabotage test plots elsewhere. Her words conjure an image of a golf course gone berserk - a state park, for example, blanketed in acres of perfect putting green turf, with no biodiversity. Harriman, Scotts' chief research scientist, counters that numerous studies by the company indicate the grass is unlikely to spread. The grass seeds are dispersed by flowering blossoms - but the closely shorn turf on a golf course is never allowed to grow tall enough to flower. The natural version of creeping bentgrass is the perfect surface for a golf ball because as its name suggests, it "creeps" - growing in a smooth horizontal plane. 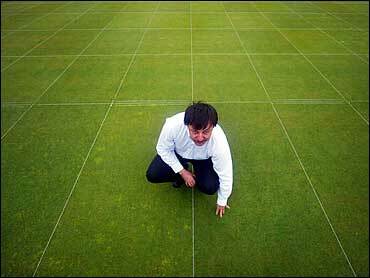 But, as Harriman points out, kneeling to stroke a patch adjoining the bentgrass test site, the silky smoothness can get interrupted by a coarse weed - a yellow grass that grows vertically in bunches, like an artichoke. On a putting green that acts as a speed bump, deflecting the ball and frustrating even the most talented golfer. The problem is that trying to kill the weed with an herbicide, such as Monsanto Co.'s Roundup, would also kill the creeping bentgrass. The grass tested here is engineered to be resistant to Roundup. A superintendent who seeds his putting green with this grass will be able to spray it at will - and only the yellow weed will shrivel and die, leaving the velveteen bentgrass. That would be a golf course superintendent's dream. Of the 15,000 courses in the United States, only the most elite can afford to wipe out the yellow weed, either by fumigating the entire green, or else handpicking the clumps. The United States Golf Association has come out in favor of the biotech grass. After all, 60 different bioengineered crops have received federal approval - including tomatoes, corn, soybean, canola, potatoes and papaya trees. "What we're saying is let's be very careful until it is proven that its not going to do the things we're concerned about - like take over," says Jim Gladen, director of the Forest Service's watershed, fish, wildlife, air and rare plants division. "Our budget is already strained trying to control invasive species - having one more will really be difficult for us," she says. Four years ago, a group dubbing itself the Anarchist Golfing Association broke into a seed research facility in Portland, Ore., and stomped on experimental plots, then spray-painted the walls with the slogan, "Nature Bites Back." Biotech saboteurs struck about 20 targets around that time, including the 1999 fire that burned part of Michigan State University's Agriculture Hall. Such attacks make biotech companies nervous, but they are not abandoning their testing. Oregon farmers hand-picked by Marysville, Ohio-based Scotts are growing nearly 400 acres of biotech grass in Madras, a three-hour's drive from Gervais.